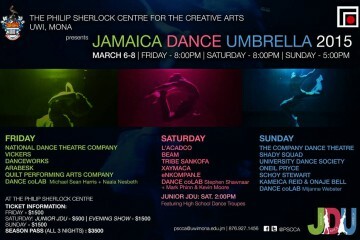 YardEdge interviews Jamaican Dancer Sodanne Browne as part of this week’s feature on the Jamaica Dance Umbrella on this weekend. Sodanne: I’ve been a dancer since I’ve known myself…I honestly didn’t make the choice. Dance is to me what air is to everyone. We all have to breathe…I have to dance. It’s who, what & how I am. Sodanne: My work is a reflection of life in general. Life is made up of various types of people, emotions, personalities, races, beliefs, colours, elements and much more. It has always been my passion and intention to be a diverse dancer so that my work can truly reflect the varieties in life. Otherwise, I think it would be boring and somewhat an injustice to such an expressive art form, to have the talent and not express as much as I can through it. Sodanne: From classical ballet to dancehall and everything in between. Sodanne: Professional Moves Dance Company, for which I am also co-artistic director. Conray & Matthew Richards- remarkable physical & psychic energy reflected through an admirable blend of raw talent & tons of wit. Sodanne: The fact that there is nothing else I’d rather be doing. Sodanne: My underwear was my leotard, my living room floor was my studio, my family’s WIDE VARIETY of music in our house was the beat that drove my little feet to move like a dancer. I was about 2 and I had already been dancing for 2 years. How did I get started? I was born. Sodanne: Unexplored & insufficiently supported but filled with an abundance of phenomenal talent. Sodanne: I‘ve tried to observe and learn from various sources, both local & international. As a dance teacher, you have to give your students all the pointers to guide them in the right direction. I find that since I’ve become a teacher, I’ve been able to develop as a dancer by practising what I teach. Sodanne: Yes I’m a professional dancer. Sodanne: The fact that I’m alive to see another morning.